Free Shipping Included! 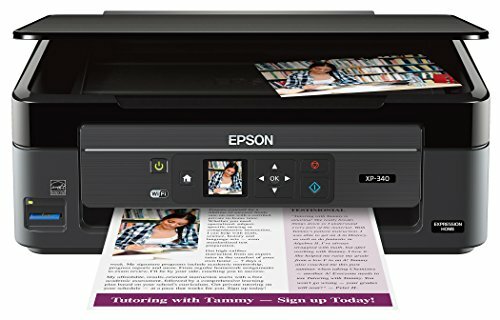 Epson Expression Home XP-340 Wireless Color Photo Printer with Scanner and Copier, Amazon Dash Replenishment Enabled by Epson at MDA-MA. MPN: XP-340. Hurry! Limited time offer. Offer valid only while supplies last. *Printer is designed for use with Epson cartridges only, not third-party cartridges or ink. *This product uses only genuine Epson-brand cartridges. *Printer is designed for use with Epson cartridges only, not third-party cartridges or ink. *This product uses only genuine Epson-brand cartridges. Other brands of ink cartridges and ink supplies are not compatible and, even if described as compatible, may not function properly. Compact and easy to use, the Expression Home XP-340 Small-in-One printer makes printing fast and simple. Use the 1.44" color LCD to set up the printer and navigate the menu in a snap. A complete wireless solution, the XP-340 allows you to print from virtually anywhere, with or without a network — even from your iPad, iPhone, Android tablet or smartphone. The printer’s convenient, affordable individual inks mean you only need to replace the cartridge that runs out. Plus, its 100-sheet paper capacity means you’ll reload paper less often. And, the included bonus software allows you to easily scan to Facebook and the cloud. Easy navigation - 1.44" color LCD. Affordable individual ink cartridges - replace only the cartridge that runs out. Reload paper less often - 100-sheet paper capacity.